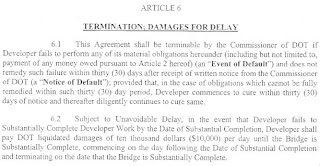 Moreover, as I describe below, "unavoidable delays" could extend the deadline to 60 months, or five years, to finish the job, without penalty--and loose contract language could stretch that deadline even more. I informed Terry Urban, co-chair of the Council of Brooklyn Neighborhoods, a plaintiff in the lawsuit challenging the AY environmental review, of the deadline and asked for comment. "It is completely unacceptable that the DOT gave Forest City Ratner three years, plus possible extensions, to re-open the Carlton Avenue Bridge, while representing to the electeds and the community that the work would only take two years," she said. "But it is shocking that the ESDC [Empire State Development Corporation] represented to the appellate court that the work would be completed in two years, although as the lead agency on the project, it was unquestionably aware that the DOT contract gave FCR three years," she added. "Now work on the bridge has completely halted, without explanation or a restart date, and it is clear that there is no government authority with the will or desire to protect the community from Forest City Ratner." The two-year estimate was in the Final Environmental Impact Statement (p. 17-23 of the Construction Impacts chapter, above) produced by the ESDC. And was cited in an ESDC Memorandum of Law (p. 13, PDF) filed 1/25/08 in the case challenging the Atlantic Yards environmental review. The DOT says the work is "scheduled for completion January 2010." No timetable, however, was provided in the community notice (right) the ESDC issued last year regarding the closure and reconstruction of the bridge. Maybe they were on to something. 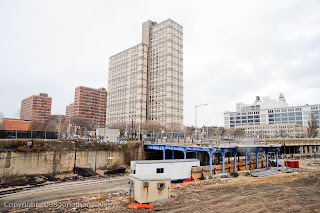 Asked to comment, City Council Member Letitia James, who lives north of the bridge in Clinton Hill, contended, "The reconstruction of the Carlton Avenue Bridge is related to the now doomed Atlantic Yards project. The reconstruction of the bridge was not necessary. The bridge provided me and others safe passage to Prospect Heights and Park Slope. Governor [David] Paterson should return the bridge to a state of good repair and reopen it immediately to the community." I noted that the bridge reconstruction is a city, not a state project; James pointed out that the state has overall responsibility for Atlantic Yards. The ESDC, of course, says reconstruction was necessary to enable a new railyard in the project. Then again, if there's no project, there's no need for a new railyard. 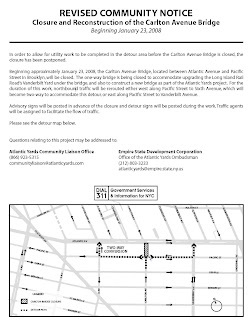 After I filed a FOIL request, the DOT provided the Carlton Avenue Bridge Construction Agreement. (First page at right.) It allows for up to 36 months for completion, with extensions possible for "unavoidable delay." It was signed 12/17/07, a year and nine days after the ESDC approved the project. Similarly, the State Funding Agreement for the project, signed in September 2007, provides far more lenient deadlines than in project documents approved nine months earlier. However, those damages might not kick in after three years. 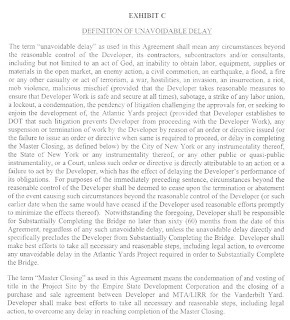 Nothwithstanding the foregoing, Developer shall be responsible for Substantially Completing the Bridge no later than sixty (60) months from the date of this Agreement, regardless of any such unavoidable delay, unless the unavoidable delay directly and specifically precludes the Developer from Substantially Completing the Bridge. 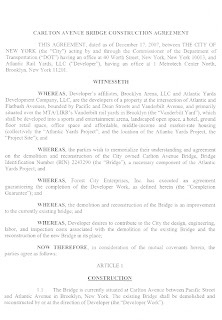 Developer shall make best efforts to take all necessary and reasonable steps, including legal action, to overcome any unavoidable delay in the Atlantic Yards Project required to Substantially Complete the Bridge. In other words, if "unavoidable delays" extend past the three-year deadline, the developer would have only a two-year grace period for such delays--unless the "unavoidable delays" are really, really unavoidable. That strikes me as giving the developer a lot of leeway. When I posed questions to the ESDC, I was told to ask DOT. The DOT's response, as noted above, was brief. I asked both ESDC and DOT why the more generous deadline wasn't announced, and whether the there's any current estimate on when the bridge would be reconstructed. No answers were provided. Another unanswered question I posed: why aren't such projects announced as, for example, "expected two years, with up to three years contractually possible"? After all, when pressed by Paterson about Ground Zero, Port Authority of NY/NJ Chairman Christopher Ward, according to the Times, presented two dates for each project: a target date and a “probabilistic” date, based on computer analysis of all the many random things that might go wrong.